One of the southern states of the United States; admitted Dec. 14, 1819; seceded Jan. 11, 1861; and was readmitted July, 1868. No definite date can be assigned to the first settlement of Jews in the state of Alabama. It is known, however, that Jews were settled in the district of Mobile, in the southwestern part of the state, as early as 1724. Mobile was then one of the nine districts of the French colony of Louisiana, over which Bienville had been placed as governor. In March, 1724, he, in the name of the king, issued his celebrated "Black Code," one of the provisions of which was that all Jews must leave the colony, and that the Roman Catholic religion would be the only religion tolerated there. A searching investigation has been made with a view to discovering records referring to the Jews of the Mobile district, but no such records have been found. Not until about a half-century later is the name of a Jew found, and then in connection with incriminating charges preferred against Governor Farmer. By the treaty of Paris in 1763, the Mobile district became a part of the British possessions of North America; and the British authorities appointed Major Farmer governor of the district. He held the office until 1776, when he was charged with being guilty of "sending flour for the king to New Orleans or attempting to sell it there by means of Pallachio, a Jew." Nothing has been found in these accounts which would incriminate Pallachio. In 1785 Abram Mordecai left Pennsylvania to settle in Alabama, in Montgomery county, where he was the pioneer Jewish settler. 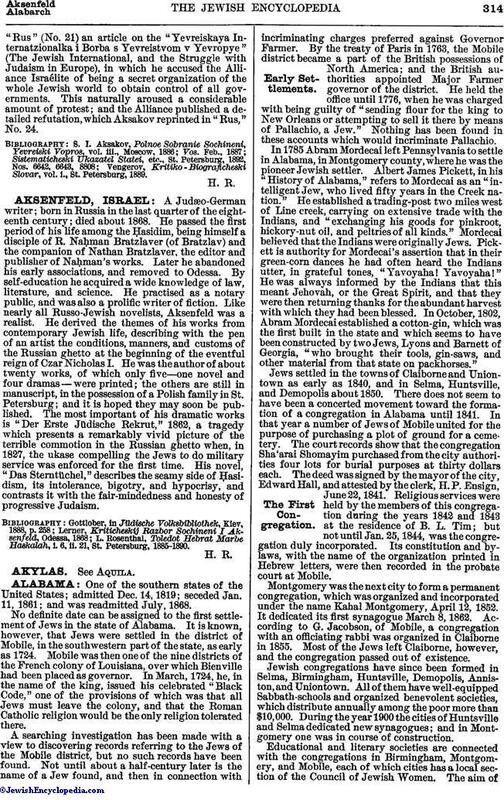 Albert James Pickett, in his "History of Alabama," refers to Mordecai as an "intelligent Jew, who lived fifty years in the Creek nation." He established a trading-post two miles west of Line creek, carrying on extensive trade with the Indians, and "exchanging his goods for pinkroot, hickory-nut oil, and peltries of all kinds." Mordecai believed that the Indians were originally Jews. Pickett is authority for Mordecai's assertion that in their green-corn dances he had often heard the Indians utter, in grateful tones, "Yavoyaha! Yavoyaha!" He was always informed by the Indians that this meant Jehovah, or the Great Spirit, and that they were then returning thanks for the abundant harvest with which they had been blessed. In October, 1802, Abram Mordecai established a cotton-gin, which was the first built in the state and which seems to have been constructed by two Jews, Lyons and Barnett of Georgia, "who brought their tools, gin-saws, and other material from that state on packhorses." Jews settled in the towns of Claiborne and Union-town as early as 1840, and in Selma, Huntsville, and Demopolis about 1850. There does not seem to have been a concerted movement toward the formation of a congregation in Alabama until 1841. In that year a number of Jews of Mobile united for the purpose of purchasing a plot of ground for a cemetery. The court records show that the congregation Sha'arai Shomayim purchased from the city authorities four lots for burial purposes at thirty dollars each. The deed was signed by the mayor of the city, Edward Hall, and attested by the clerk, H. P. Ensign, June 22, 1841. Religious services were held by the members of this congregation during the years 1842 and 1843 at the residence of B. L. Tim; but not until Jan. 25, 1844, was the congregation duly incorporated. Its constitution and by-laws, with the name of the organization printed in Hebrew letters, were then recorded in the probate court at Mobile. Montgomery was the next city to form a permanent congregation, which was organized and incorporated under the name Kahal Montgomery, April 12, 1852. It dedicated its first synagogue March 8, 1862. According to G. Jacobson, of Mobile, a congregation with an officiating rabbi was organized in Claiborne in 1855. Most of the Jews left Claiborne, however, and the congregation passed out of existence. Jewish congregations have since been formed in Selma, Birmingham, Huntsville, Demopolis, Anniston, and Uniontown. All of them have well-equipped Sabbath-schools and organized benevolent societies, which distribute annually among the poor more than $10,000. During the year 1900 the cities of Huntsville and Selma dedicated new synagogues; and in Montgomery one was in course of construction. Educational and literary societies are connected with the congregations in Birmingham, Montgomery, and Mobile, each of which cities has a local section of the Council of Jewish Women. The aim ofthe congregational societies and the sections of the Council of Jewish Women is to foster a closer study of the Bible and a deeper knowledge of Jewish history and literature. The order B'ne B'rith is represented in Birmingham, Montgomery, Mobile, Selma, Huntsville, Anniston, Demopolis, and Uniontown. Sheffield, with about 3,000 inhabitants, has a Jewish cemetery and a Sabbath-school. When Sheffield was laid out in 1884 by a land company, two Jewish brothers by the name of Moses, of Montgomery, were among the prime movers in the enterprise. Capt. Alfred H. Moses, who had been in the Confederate service, was the first manager of the company; and under his able administration the undertaking prospered. At the outset lots were set apart for a Jewish house of worship; and separate grounds for a Jewish cemetery were laid out. The first postmaster of Sheffield was Morris Nathan, who received his appointment from President Cleveland. Philip Phillips was a prominent Jew who lived in Alabama about twenty years. He was a native of Charleston, S. C., and removed to Mobile in 1835. He was elected to the legislature in 1844; the next year he published a digest of the decisions of the supreme court; in 1851 he was returned to the legislature, and two years later was elected to Congress over Hon. Elihu Lockwood, of Mobile county. 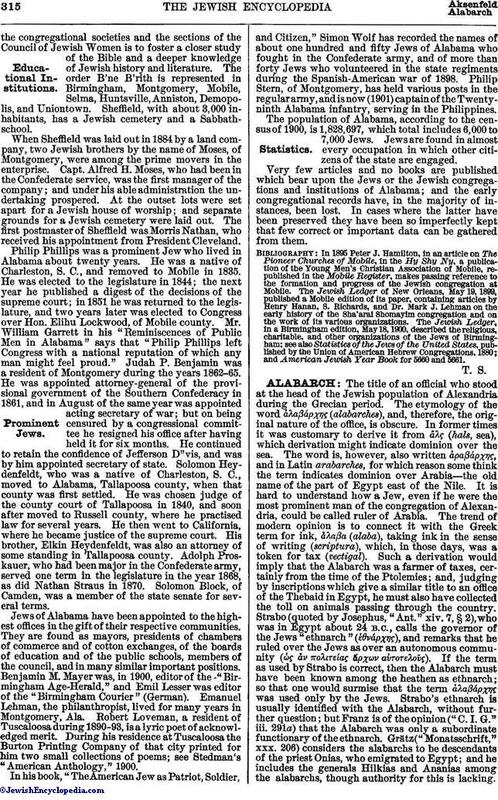 Mr. William Garrett in his "Reminiscences of Public Men in Alabama" says that "Philip Phillips left Congress with a national reputation of which any man might feel proud." Judah P. Benjamin was a resident of Montgomery during the years 1862-65. He was appointed attorney-general of the provisional government of the Southern Confederacy in 1861, and in August of the same year was appointed acting secretary of war; but on being censured by a congressional committee he resigned his office after having held it for six months. He continued to retain the confidence of Jefferson D"vis, and was by him appointed secretary of state. Solomon Heydenfeldt, who was a native of Charleston, S. C., moved to Alabama, Tallapoosa county, when that county was first settled. He was chosen judge of the county court of Tallapoosa in 1840, and soon after moved to Russell county, where he practised law for several years. He then went to California, where he became justice of the supreme court. His brother, Elkin Heydenfeldt, was also an attorney of some standing in Tallapoosa county. Adolph Proskauer, who had been major in the Confederate army, served one term in the legislature in the year 1868, as did Nathan Straus in 1870. Solomon Block, of Camden, was a member of the state senate for several terms. Jews of Alabama have been appointed to the highest offices in the gift of their respective communities. They are found as mayors, presidents of chambers of commerce and of cotton exchanges, of the boards of education and of the public schools, members of the council, and in many similar important positions. Benjamin M. Mayer was, in 1900, editor of the -"Birmingham Age-Herald," and Emil Lesser was editor of the "Birmingham Courier" (German). Emanuel Lehman, the philanthropist, lived for many years in Montgomery, Ala. Robert Loveman, a resident of Tuscaloosa during 1890-93, is a lyric poet of acknowledged merit. During his residence at Tuscaloosa the Burton Printing Company of that city printed for him two small collections of poems; see Stedman's "American Anthology," 1900. In his book, "The American Jew as Patriot, Soldier, and Citizen," Simon Wolf has recorded the names of about one hundred and fifty Jews of Alabama who fought in the Confederate army, and of more than forty Jews who volunteered in the state regiments during the Spanish-American war of 1898. Philip Stern, of Montgomery, has held various posts in the regulararmy, and is now (1901) captain of the Twenty-ninth Alabama infantry, serving in the Philippines. The population of Alabama, according to the census of 1900, is 1,828,697, which total includes 6,000 to 7,000 Jews. Jews are found in almost every occupation in which other citizens of the state are engaged. Very few articles and no books are published which bear upon the Jews or the Jewish congregations and institutions of Alabama; and the early congregational records have, in the majority of instances, been lost. In cases where the latter have been preserved they have been so imperfectly kept that few correct or important data can be gathered from them. and American Jewish Year Book for 5660 and 5661.